We at Powder Valley Poodles only breed dogs who have passed many tests to insure that we only produce physically, mentally, and behaviorally superior puppies. The dogs profiled on this page are who we hope to breed in the future. However, they first have to undergo many tests — hips, eyes, heart, temperament — before being placed in our breeding program. Our puppies are the future of our program. Leo is a stud prospect that will add size and depth to our Standard Poodle breeding program. He is a big, sturdy, puppy who will mature into a bigger, even sturdier, dog. Leo has passed all of his preliminary tests for breeding suitability. We are now waiting for him to get old enough to look at his hips and elbows. Assuming his hips and elbows are normal, look for Leo’s offspring in late 2019. We are also getting Leo ready for the show ring. It will be interesting to see how the judges react to his natural, un-docked and happy tail. We will be showing Leo in the regional IABCA show in Greeley in Oct. this year. Hope to see you there! Foxy is our gorgeous miniature poodle daughter of Robbie and it shows! She has his color and his markings. Her temperament is splendid — like Robbie she is sweet, friendly, intuitive and very, very smart. She’s still very young but I’m hoping to add her to our line up in late 2020. Honey is one of our up and coming goldendoodle girls. She at 9 mo. of age has just passed her first two very important tests to determine breeding eligibility — hips and temperament. A wonderful, sweet, and affectionate girl, she will continue with her testing which I have no doubt she will pass. Look for puppies from Honey in early 2020…. 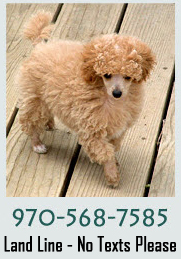 Check back soon for more up and coming dogs from Powder Valley Poodles!